In the military when you look at someone's ribbon bar, you get a sense of where they've been and what they've accomplished. With Maj. Gen. Eugene R. Chojnacki, outgoing Commander of the New Jersey Air National Guard, that ribbon rack only begins to tell his story. A Distinguished Flying Cross with one Oak Leaf Cluster, an Air Medal with one Silver Oak Leaf Cluster, the Vietnam Service Medal with one Bronze Star Device, the Republic of Vietnam Gallantry Cross with Device only begins to tell the story of where the man has been and what he has accomplished. Reading through the dry, bare bones official biography you see the experiences that shaped the man. Growing up in the 60's, Chojnacki was impressed by President Kennedy's idealism, so much so that after getting his Bachelor of Arts in Industrial Education, Trenton State College in 1967, he went on to attend and get his commission through Officer Training School, Lackland Air Force Base, Texas, in 1968, a tough time in United States history to be considering a military career. After completing Undergraduate Pilot Training, Reese Air Force Base, Texas, in 1969, Chojnacki completed training in the C-141A Starlifter and was assigned to the 20th Military Airlift Wing, Dover Air Force Base, Del. Two years later he attended Helicopter Transition Training at Sheppard Air Force Base, Texas. In 1971, Chojnacki was assigned to the 20th Special Operations Squadron, Cam Rahn Bay, Republic of Vietnam, as an UH-IN helicopter pilot. During his combat tour, he flew 120 combat missions over Cambodia, Laos and Vietnam. After returning to the States in 1972, Chojnacki was a helicopter instructor pilot until his discharge in 1973. It became obvious, that Chojnacki missed the military. He was now living in South Jersey and was close to the 177th Fighter Interceptor Group (what would one day become the 177th Fighter Wing). Seeing the F-106 Delta Darts taking off and escorting Soviet Bear bombers down the coast to Cuba had a profound impact on him so in 1977 he returned to active military status and accepted a commission with the New Jersey Air National Guard. From that point on, he rose through the Wing from budget officer, computer operations officer, comptroller, chief of supply, deputy commander for resources, support group commander and finally vice commander in 2002. 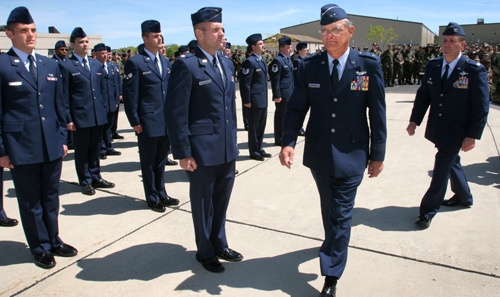 With the advent of the Global War on Terrorism and after the 177th had adjusted to flying combat air patrols Chojnacki was chosen to serve as the Chief of Staff, New Jersey Air National Guard in August 2002. In February 2004, he was chosen by Maj. Gen. Glenn K. Rieth to become the New Jersey Air National Guard Commander. Truly, what a story.